Why looking up matters A positive attitude is important, but until now we didn’t know how important. In Up, a practicing physician and NIH-funded researcher draws on her research and experience to show that our outlook on life— our unique patterns of thinking and feeling about ourselves, others, and the world—may be the key to how well and how fast we age. From wrinkles to cognitive decline, our outlook affects our health at every level. Using the framework of outlook GPS, Up illustrates how we can gauge our current attitude latitude and move to healthier ground. Tindle brings a fresh eye to attitudinal traits such as optimism, noting that it has many faces, including the face of her own struggling optimism. 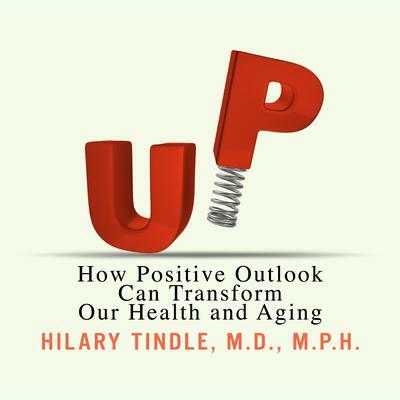 Using the 7 Steps of Attitudinal Change that she applies to her own patients, Tindle offers us a path toward healthy aging. Prescriptive and accessible, Up puts forward a paradigm shift in how we age and treat disease, giving even the most struggling optimists a chance for hope.